Protect Your Immune System by Refusing To Be Dominated! Corticosteroids (also known as corticoids) are hormones secreted by the outer portions of the adrenal glands. They can be divided into three groups, for each of which there are separate receptors: androgens, which are involved in the development of sexual traits; mineralocorticoids (aldosterone, corticosterone, desoxycortisone), which regulate the body's osmotic balance; and glucocorticoids (cortisone, hydrocortisone, prednisone), which, in addition to their anti-inflammatory and immunosuppressive effects, stimulate the synthesis of glucose and increase the mobilization of fatty acids and proteins to meet the higher metabolic demands generated by stress. Glucocorticoids play an extremely important role in fear and anxiety reactions and in depressive states. These hormones often affect behaviour by increasing or decreasing the efficiency of certain neural pathways. When someone perceives a situation as disagreeable or dangerous, a general response to this stress is triggered in their body. Depending on the situation and the person's experience with such situations, he or she will choose a behaviour: either fight, or flight, or inhibition of action (the status quo). The body's response from the time it perceives a danger to the time it secretes the hormones to prepare to deal with it involves the following structures, in the following order: 1) the limbic system, 2) the hypothalamus, 3) the pituitary gland, and 4) the adrenal glands. The adrenal glands secrete glucocorticoids (such as cortisol, in human beings), which interact with the serotonin receptors in the brain. When someone experiences a stressful event, the level of glucocorticoids in their blood rises. 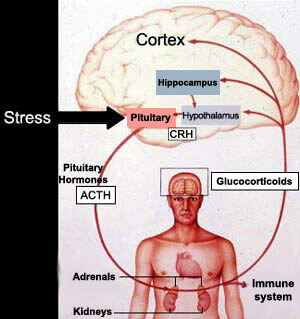 Stress activates the hypothalamus, which then secretes corticotropin-releasing hormone (CRH). The CRH in turn causes the pituitary gland to release adrenocorticotropic hormone (ACTH) into the bloodstream, from which it enters the adrenal glands and causes them to secrete cortisol. This process creates a negative feedback loop in which the excess cortisol activates the brain's glucocorticoid receptors and suppresses the production of CRH. In depressed patients, however, this loop no longer works, resulting in excess production of CRH and hence of cortisol. Many seriously depressed patients have high blood levels of cortisol, caused by chronic stress. In rats, chronic stress and/or a high level of glucocorticoids alters certain serotonergic receptors (increases the 5-HT2A receptors in the cerebral cortex and reduces the 5-HT1A receptors in the hippocampus). These same changes have been observed in humans who have committed suicide or suffered from diseases that cause hypersecretion of glucocorticoids. The continued administration of antidepressants causes changes in the serotonergic receptors that are the opposite of the changes produced by chronic stress. It also reverses the hypersecretion of stress hormones. Not incidentally, in humans, many glucocorticoid receptors (GRs) and mineralocorticoid receptors (MRs) (see sidebar) are located in the hypothalamus and the hippocampus, two structures involved in mood control and the ability to experience pleasure. These receptors are sensitive both to the levels of the various corticosteroids in the body and to the length of time that they are active, so their activation mechanisms will have direct impacts on the behavioural response chosen to a given stimulus. For example, when corticosteroids circulate at low levels they facilitate, via the MR receptors, the reactions associated with fear (momentary paralysis and turning toward the frightening stimulus). But when corticosteroids circulate at high levels (for example, when the organism is exposed to chronic stress), they instead potentiate inhibition of action, via the GR receptors . Prolonged chronic stress also seems to alter the response of the MR and GR receptors and to have very harmful effects on people's mental equilibrium, especially when social or family supports are absent. Under these conditions, the glucocorticoid response, which was originally highly adaptive, becomes clearly maladaptive. It has long been known that depressed persons display hyperactivity in the hypothalamic-pituitary-adrenal (HPA) axis (see illustration and explanation above). A prolonged state of inhibition of action is also known to encourage the emergence of a depressive state. This chronic excess stress on the HPA axis is believed to result in structural changes in certain parts of the brain. For example, region CA3 of the hippocampus loses large numbers of neurons when subjected to prolonged stress. Other studies have also reported a reduced number of glucocorticoid receptors in the hippocampus and prefrontal cortex of suicide victims. Though it is hard to tell whether these structural changes are of genetic origin or the result of chronic activation of the HPA axis, they would be consistent with hyperactivity in this axis when the natural braking effect of these receptors was reduced. Here's another example: people with Cushing's syndrome, a disease in which the body produces excess cortisol, display a high incidence of depression, and their depression lifts when they are given treatments that bring their cortisol levels back to normal. Thus, all indications are that the end products of the HPA axis—glucocorticoids— play a role in depression by influencing several neurotransmitter systems, including those for serotonin, norepinephrine, and dopamine, all three of which are involved in depression. Treatment with antidepressants is often regarded as consisting of two phases. During the first two weeks, the patient's depressive state does not really improve. But after two or three weeks, the patient gradually begins sleeping and eating again, feeling more energetic, and having more positive thoughts. It is recommended that treatment then be continued for several months to minimize the risk of a relapse. Various hypotheses have been offered to explain this lag before antidepressants become effective. One hypothesis is that at the start of the treatment, once the antidepressant medication has inhibited the reuptake of serotonin, the serotonin autoreceptors quickly become saturated, so that their inhibitory effect predominates, reducing the amount of serotonin released into the synaptic gap. But over time, these autoreceptors become desensitized, and the presynaptic neuron can produce action potentials more readily. Because the antidepressants are still preventing the serotonin from being reabsorbed, its extracellular concentration increases, and serotonergic transmission is facilitated. Another interesting hypothesis deals less with the efficiency of existing connections that with the development of completely new neurons. The effect of antidepressants can be compared with that of ecstasy, which causes the release of large amounts of serotonin from the nerve endings of neurons. This excess of serotonin is suspected to be the source of the particular mental effects of ecstasy, including those associated with feelings of well-being—effects analogous to those of antidepressants. The development of various classes of antidepressants has tracked the development of biochemical hypotheses concerning depression. An initial hypothesis formulated in the 1960s identified norepinephrine as the main neurotransmitter involved in depression. According to this “catecholamine hypothesis”, depression was due to a deficiency of norepinephrine in certain circuits of the brain, while mania was due to an overabundance of this same neurotransmitter. Though this hypothesis is still recognized, it does not explain everything, in particular why there are some people whose mood is not affected by fluctuations in their norepinephrine levels. In the 1970s, the “permissive hypothesis” emerged, which postulated that another neurotransmitter, serotonin, was involved in depression. According to this hypothesis, a reduction in the amount of serotonin in certain synapses may cause depression by triggering or “permitting” a drop in norepinephrine. Consequently, though norepinephrine was still acknowledged to play an important role in depression, attempts could now be made to treat depression by acting on the body's serotonin levels. This has been the therapeutic approach applied using Prozac and all the other selective serotonin reuptake inhibitors (SSRIs) that have come on the market since the 1980s. A third neurotransmitter of importance in depression is dopamine, the same molecule that is involved in schizophrenia and Parkinson's disease. Dopamine plays an important role in rewards and positive reinforcement— in other words, in the pursuit of gratification. The use of dopaminergic substances and stimulants as antidepressants produces quick, positive results in many patients, which makes these substances useful complements to other antidepressants that may take several weeks to act. Medications that act directly on dopamine must be used cautiously, however, because they can create dependencies. Many drugs, such as cocaine, opiates, and alcohol, increase the production of dopamine, which may explain why many people with depression use them. Many researchers now believe that it is not really appropriate to describe the physiological causes of depression as a "chemical imbalance". The hypothesis that depression was caused by a "chemical imbalance" originated in the 1960s. 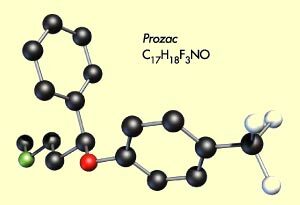 The first antidepressant medications, developed around that time, were tricyclics and monoamine oxidase inhibitors (MAOIs). In addition to alleviating the symptoms of depression in many patients, these molecules were known to increase brain levels of dopamine, norepinephrine, and serotonin in various ways. For this reason, researchers hypothesized that depression might be due to an imbalance in these neurotransmitters. This hypothesis did indeed yield some fairly useful research findings during the last decades of the 20th century. In addition, by emphasizing that mood disorders might be related to a physiological malfunction and not simply to a character defect or a lack of will power, this hypothesis reduced the needless feelings of guilt that often haunted people with depression. However, the results of efforts to identify this "chemical imbalance" more precisely have been rather disappointing and contradictory. Research is now focusing less on the neurotransmitters themselves and more on the receptors for these molecules and on the molecular events involved in regulating genes. But here too, there is room for controversy. Relatively little direct evidence has been found of alterations in receptors or anomalies in gene expression related to these receptors or other enzymes in cases of depression. Moreover, the reason for the two to three week lag between the time when antidepresssants first affect neurotransmitters and the time when they begin to affect mood (see sidebar to the left) is still not well understood. In short, the situation is far more complex than scientists believed in the 1960s when they first formulated the "chemical imbalance" hypothesis. Given these problems in securing any unequivocal data to support this hypothesis, some scientists have begun to ask whether the extensive use that continues to be made of the term "chemical imbalance" might raise some ethical problems, or even political ones. In the United States, for example, where advertisements for antidepressants are allowed in the mass media, the pharmaceutical companies have not always worried about this fine point. Simplistic advertisements tell Americans that when they are depressed, a substance in their brain is out of balance, and that if they take the right antidepressants, the ideal balance will be magically restored. These advertisements may well have something to do with the stunning success of SSRI antidepressants, such as Prozac, Zoloft, and Paxil, in the marketplace, and the billions of dollars that they have earned for the companies that make them. The effects of antidepressants are not limited to the presynaptic neurons. In postsynaptic neurons, the antidepressive effect of tricyclics and MAOIs may be attributable to “down-regulation” (reduction in the number but not the sensitivity) of the beta-adrenergic receptors and the 5-HT2 serotonergic receptors. Desensitization is also observed in the norepinephrinergic receptors coupled to adenylate cyclase . The phenomena of transduction via the G-proteins paired with the receptors represent another possible site of postsynaptic effects, as is probably the case for lithium.